It's curious that the very adult film The Dark Knight should prove so very suitable for toys, with most of the more toy-worthy characters being vicious sociopaths no child should ever come in contact with. One such character is Two-Face, of whom the two deeply talented Nolan brothers transformed into something much more ghoulish and horrifying than was ever seen in DC Universe, both in visage and in character. The scene in which Harvey Dent's mutilated face was revealed was one of the most nightmarish in an already-nightmarish film, and as a singleminded psychopath driven mad by chaos and fueled by a need to execute those responsible for his current state, Harvey was transformed into an antagonist as tragic as he was twisted. A common complaint levelled at the film was that Two-Face's screentime was too short, and that he was dispatched too easily, but I'm hasty to disagree - less a supervillain than a wreck (in a film populated solely by people in different states of ruin) any inflation of his character would have reduced him, rather than enhanced. Christopher Nolan has been adamant that we will not see him again, and it makes his death - and place in this universe - all the more poignant. With that out of the way, Mattel has made a very decent figure from the character in their Movie Masters series. 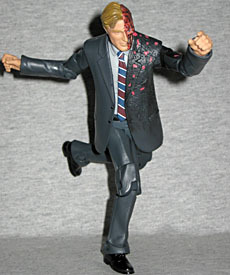 Standing just under 6" tall, Two-Face is sculpted similarly to the line's Harvey Dent figure, leaving one half intact and the other half sickeningly disfigured. It's the same grey suit as Dent with one side of his jacket torn and burnt, very similar to the film. The Harvey Dent side of his face is very much Aaron Eckhart, very likely better than the Dent figure, and the other side is scarred up with decently sculpted seared flesh (with plenty missing) and the defining details from the film's stunning make up and CGI - note the muscle holding the bottom of the jaw to the skull, and the forever-opened-eye. 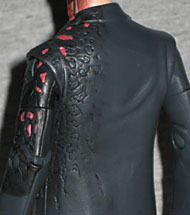 The paint is quite good for Mattel, though not up to the higher standard set by McFarlane Toys: the coat is primarily two colours, with some burnt areas looking too bright, while his face is better with a strong purple-black highlighting the main burns with blacks stippled in to give detail. It's not bad, just not exceptional; as usual, Mattel's promotional shots are far more impressive, but from any distance this is undoubtly the character from the film. Two-Face is very articulated, featuring the standard (and excellent) Movie Masters articulation of balljointed shoulders and neck, pin-jointed elbows, knees and feet, then jointed wrists, biceps, thighs, midsection and legs that have the "H-joints," as fans call them - a swivel and a hinge, but done in a squarish way, rather than as a pretend balljoint. He's fully posable, and his wrists are sculpted to hold a gun, and his (now imaginary) coin. Actually, the gun is imaginary too - disappointingly Two-Face doesn't come with his gun, though this can be easily tasked from... Punisher? Nick Fury? Domino? One of DC Direct's Two-Faces? There are lots of 6"-scale figures with guns, you can probably find him one somewhere in your collection. 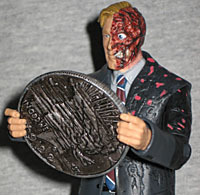 On a better note, Two-Face does come with a prop replica, something I thought was sadly missing from Jail-Cell Joker, and it's a great one - his burnt coin. It's slightly bigger than it should be and the non-burnt side isn't painted well, but it's heavy and feels like a coin, and the burnt side is awesome. This is a great accessory that makes sense for the figure and that'll fit right into one of those evidence baggies from the other Movie Masters toys as a great piece of merchandise from the film. Overall, Two-Face is a very good figure, even with the slight downsides. It's the one we were waiting for after all, through the different similar releases of Batman and the different Jokers, and sold out on Matty surprisingly quickly. Fortunately, the decision to put these back in brick-and-mortor stores means he can be acquired from Toys Я Us without succumbing to the Matty beast. Two-Face was worth the wait.